Quality grade 80 alloy steel assembled chain slings, carry a minimum safety factor of 4:1 and are proof tested 2:1 for high working load limits. Available with sling hook (SOS, DOS) or grab hook (SOG, DOG). Each sling is certified with an identification tag. Chain Size" Type Model no. Model no. Model no. Used in conjunction with overhead cranes, hoists or winches. Nylon slings are available in single ot double ply to protect heavy, irregular sized loads from scratching or marring. Slings must be checked frequently. Should any surface area show signs of wear or cutting, the sling must be replaced immediately. Each sling is tagged with manufactured date and capacity. Forged alloy end fittings: Triangle at one end, choker at the other. Webbing forms a slip noose by slipping the triangle through the chocker. Forged alloy end fittings for single or double sling basket hitches soft webbing conforms to the load shape without damaging painted or polished surfaces. Commonly used as a basket and/or choker hitch. For choker hitch pass one eye through the other flat eye also makes for easy withdrawal from beneath loads. Reverse eyes make a full functional contact with lifting hooks without the use of hardware. 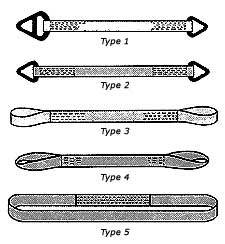 This type is widely used for both choker and basket hitches. Most versatile and widely used sling. The economical answer to most lifting problems, ideal for vertical, choker, and basket hitches.